min:60 is proud to introduce Vernissage, the most advanced device mockup composer, for sharing your screens with clients and exporting them to online stores such as the AppStore! Exclusive for macOS. Vernissage makes it easy for anyone to create great looking app presentations and App Store presentations. Results can be instantly shared, added to documents, presentations or printed. The vector engine makes it possible to create PDF documents with infinite scaling or export to images of any resolution. Available now as a free download (with In-App Purchases) on the Mac App Store. 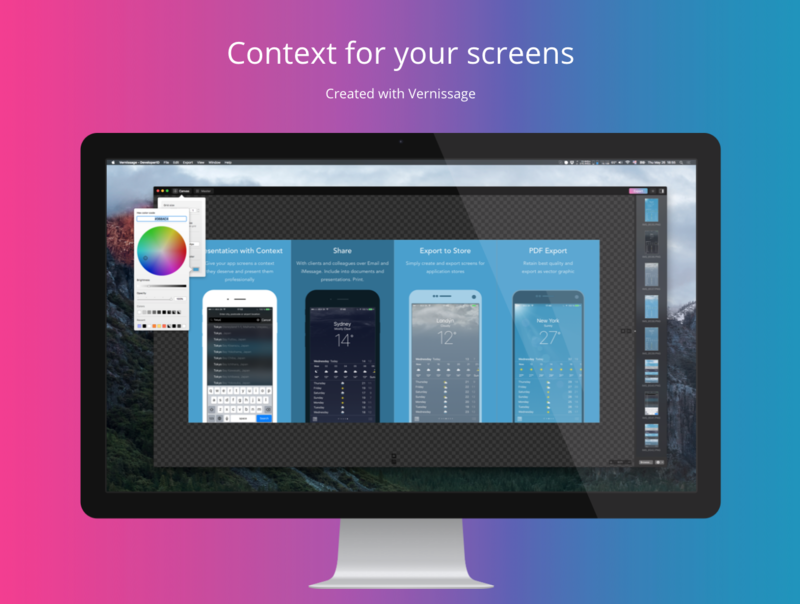 Vernissage is the most advanced device mockup composer, for sharing your screens with clients and exporting them to online stores such as the AppStore! Absolutely easy and straightforward. It gives you the ability to add context to your plain app or webpage screens. Results can be instantly shared via email, iMessage, added to documents, presentations or printed. This new tool can also be used to create presentation screens for online applications stores, such as the iOS and Mac App Store. The device library features 7 essential vector drawn devices, for the mobile, tablet and desktop platform. All devices come with different styling options from flat to realistic style, black and white, portrait and landscape, which makes more than 100 styles possible. Also included is a universal screen device and a Macintosh 128k device (which also converts the screens to match the pixel size and dithering of this legendary 1984 device). Vernissage’s vector engine, makes it possible to create .PDF documents with infinite scaling. When combined with .PDF screens, the document is completely resolution independent. Additionally, you can export to raster images of any resolution. Discover the Macintosh 128k (circa 1984) device. min:60 is a very small mobile and macOS development company based in Bratislava, Slovakia. Its clients are mostly startups in the mobile app segment and media. All Material and Software (C) Copyright 2017 / min60 s.r.o. All Rights Reserved. Apple, the Apple logo, Mac OS X, iPhone, iPod, iPad and Macintosh are registered trademarks of Apple Inc. in the U.S. and/or other countries. Other trademarks and registered trademarks may be the property of their respective owners.